Having worked in IT for a good bit of time I have thought a lot about various information technology skillsets and which will become more vs. less important as we move forward. Software development is quite strong vs. time because it’s a skill that is highly correlated with intelligence and creativity–two things that are likely to remain most resistant to automation. But both within development and without, there is an arguably more valuable skill than creating new software, and that is the consumption, processing, and displaying of information. As more and more information becomes available to us, the ability to actually do something with it will become increasingly elusive. It’s not enough to have data, in other words; one must have the ability to intelligently massage that data and then display it to an audience in an actionable way. 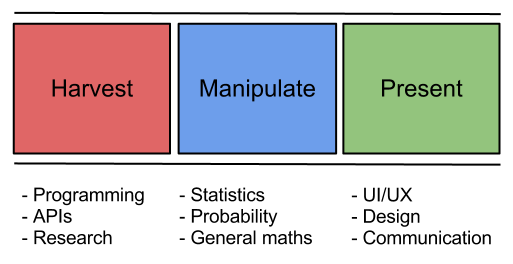 Information Processing, as described above, is currently considered three separate abilities, and they are often blended with many other skills. I believe, however, that viewing it as a skillset of its own is about to become increasingly useful. how can you get data using programming? how can you understand and massage that data using data science? how can you visualize, narrativize that data using dataviz and business skills? This is going to become an increasingly significant portion of what IT means in the future—especially for individuals trying to get into the field. If you’re good at this, you’ll be useful to almost any business. Failing at any of these three phases can be catastrophic to the outcome, or stop an outcome from being possible at all.